If you’ve never had the thrill of being blindfolded and given a stick to whack a piñata with, then you really haven’t lived. Fortunately, RealTime Gaming is about to change all of that, with the Jackpot Piñatas slot game. Bringing all the colours of the vibrant Mexican side of things to your screen, you’ll certainly have a fun time with this one. The Mexican theme has been done quite a lot in online pokies, it has to be said. However, RTG aims to bring a fun and quirky version of it to your screen with this one. It manages to do so with some appealing graphics and intriguing gameplay overall. The overall design of this RTG game incorporates five reels and three rows, so it sticks closely to what is known and appreciated. Alongside this setup, there are 20 different pay lines, which you have the option of customising. Additionally, the developer has chosen to fix the bet amount in place too, meaning that you have very few customisation options when it comes to Jackpot Piñatas. Therefore, you’ll always be placing a bet of $5 on every single spin you make, with $0.25 per line being the set value. As spoken of earlier, it does also come with some impressive graphics throughout, meaning that it has quite a nice visual appeal to it. 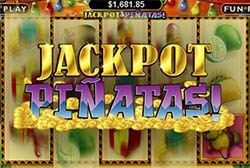 Bonus Game: The piñata of the dog is what works as this slot’s scatter symbol. Spinning three or more of this one into view in any location will trigger the bonus game round. This provides you with a secondary screen, featuring several different piñatas in the shapes of animals. You need to choose from them to reveal what is inside. There’s a maximum pay-out for this bonus round of 200 times your in-play stake. However, you need to reveal the hidden rose inside one of the piñatas within a certain number of attempts, otherwise the bonus game ends. Free Spins: You’re able to trigger five, 10, 15 or 25 Free Spins while playing this slot, which are given at the end of the previously spoken of bonus round. These are hidden within the piñatas of that round. All wins receive a double multiplier in this round, with the exception, of course, of if you win the progressive jackpot. Progressive Jackpot: You’ll see the total value of this constantly increasing at the top of the reels. In order to win the progressive though, you need to ensure that you’re playing with all 20 lines in action. The piñata of the bull is what works as the jackpot symbol and if you spin five of them into view on a winning line, you’ll win the jackpot amount! Jackpot Piñatas Symbols: A game about the piñata wouldn’t be right if it didn’t have actual piñatas on the reels, would it? Fortunately, it does. However, there are also several other symbols there too. These are quite relative to the Mexican theme, with tacos, lime and maracas all being visible there. A wild symbol is also present in the game, represented by the donkey piñata. Whenever this one shows up on the reels, it will substitute for all other symbols, except for the dog scatter and the bull jackpot. While the theme and execution behind this game is quite appealing, the inability to customise your wager is something that is very dated. RTG fixing this amount at $5 per spin is inadequate. And yes, you may be able to reduce the number of active lines to combat this, but how about if you want to play a higher bet or the full amount of win lines with a lower wager? It’s nice to see another progressive jackpot in the RTG collection though. Read more online pokies reviews or begin playing Jackpot Piñatas at Raging Bull Casino.